The review summarizes the recent results on the influence of various modifiers on the anodic aluminum oxide (AAO) growth and morphological parameters. It is demonstrated that the modifiers can play an important role in the formation and self-ordering of AAO. 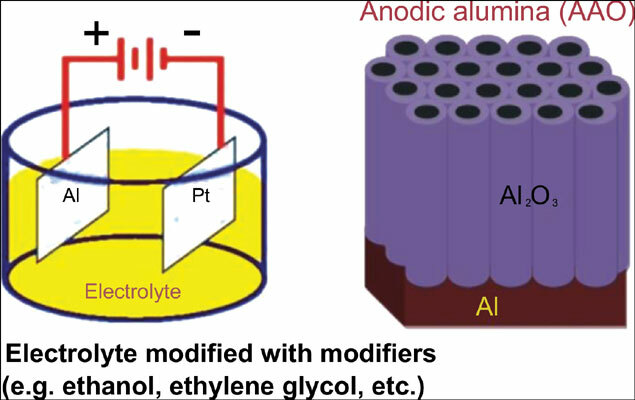 The intrinsic function of a modifier seems to depend on other operating conditions, such as a type of electrolyte used, applied anodizing voltage, the chemical structure of the modifier and its stability in the electric field, or a complex interplay between physical and chemical variables (electrical conductivity, viscosity, dielectric constant, pH, etc.). The function can also vary depending on whether the anodization is carried out under mild (MA) or hard (HA) conditions. Although there is still no coherent description of the role of modifiers in the aluminum anodization, the review shows a potential for prospective research and indicates a possibility to control the AAO formation by application of a given modifier. Anodic alumina (AAO), hard anodization, mild anodization, electrolyte modifiers, alcohols, polyols.